A social group for Wamboin women. All women are welcome on Mondays, 10.00 am to 12 noon at the Anglican Church on the corner of Poppet Road and Norton Road in Wamboin. Members come from Sutton, Gundaroo, Bywong and Wamboin, with a few from ACT and Queanbeyan. Where has the time gone? It’s hard to believe the Wonderful Women of Wamboin have been going for seven years. 2013 was a great year and along the way we raised funds for donations to the local community. At the biggest Wamboin Bonfire Night to date, WWOW’s major fundraiser, our curry stand, proved as popular as ever. Throughout the year, we continued to sew drainage bags for breast cancer post-surgery patients and knit trauma teddy bears for the Queanbeyan Ambulance Service. We are indeed a talented group of women. Margaret Ferrett, Norma Arnold and Trish Mavity won prizes in the Canberra Show, Trish also winning Overall Reserve Champion. Dianne Stoll won prizes in the Taralga Show, while Robin Asman and Kerry Garland exhibited at the Canberra Spinners and Weavers ‘Warped and Twisted’ exhibition at The Q Performing Arts Centre. Later in the year, Sally Saunders guided us through the National Gallery of Australia. A graduate of the Gallery’s tour guide program, Sally enthusiastically displayed her knowledge and passion for art as we viewed the collection. 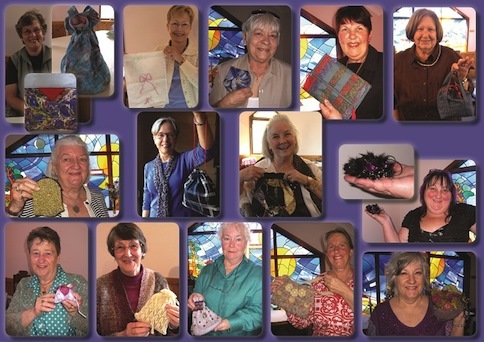 Long-term members Liz Hendrikson and Jacki Nagle conducted separate craft workshops. Liz showed us how to cover a tape measure using colourful fabric. While Jacki taught us the art of kusadama, a Japanese paper-folding method for creating stunning flowers. Early in the year, Bywong resident Randy Knispel spoke to us about caring for knives and Mayor Pete Harrison visited us to discuss local issues. It was a great opportunity to chat with Pete in a relaxed and casual atmosphere. This year our creative challenge was to make treasure bags. We had free choice of material and it was fascinating to see how each of us approached our task. Some were crocheted, knitted, needle-felted, beaded, patchworked or embroidered. Finally, one was made of metal rings and rabbit fur. This year again the WWOW conducted a Xmas mailbox and gate decorating contest. Check out the winners via the News links. Read about the competition, finalists, and competion winners. All women are welcome at WWOW to share stories, news and skills. It’s a great way to meet new people as well as catching up with old friends. We meet on Mondays, 10 am to 12 noon at St Andrew’s Anglican Church on the corner of Poppet Road and Norton Road in Wamboin.